Let's start small; does your family use toilet paper or paper towels? What a coincidence - ours does, too! 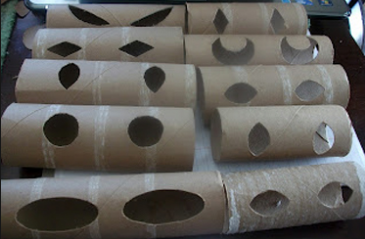 Empty toilet paper rolls can be used to create a fun, spooky effect really easily; just take the roll and cut big peering eye holes. Next, drop a glow stick inside and hide it in a bush - voilá! Something spooky lives in the bush. Better yet - half a dozen somethings! Really it would be more accurate to call this project Ghosts are diapers. You can take those old cloth diapers (or torn white sheets) and put them to ghostly good use. Cut the diaper or sheet into squares of about 10-12 inches. Grab some junk mail from your mail box (yes, we're putting everything to good use!) and crumple up paper balls about the size of a ping pong ball - one for each square. Place the paper ball in the center of the square. Gather the fabric together around the paper ball and tie it underneath with an elastic or with white thread. Leave most of the fabric to hang loose below the neck you have just created. Use a black sharpie to create eyes. Use a sewing needle and some black thread to thread through the top of the ghost's head and create a long line with which to hang your ghost in a tree. Make several, and you have a whole pod of ghosts flying outside your house. Have any old Halloween costumes lying around? Some people sell them or hand them down - both great options. But what we do? We stuff them full of more junk mail (yes, we get a lot) and/or black balloons (those we have to buy) and pose them around our garden, in trees, climbing over the patio wall, playing cards - you name it. Empty gallons of milk are the perfect size for putting inside masks, with a long stick in the opening to attach it to the stuffed body. We do the same with outgrown black clothes, too! Add a mask from the 99¢ store, and you've got a creepy guy in the tree. 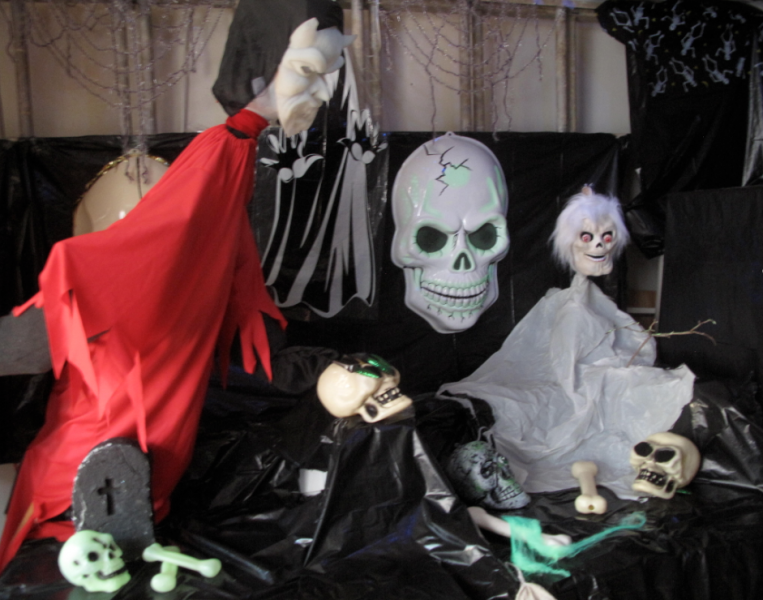 This one is so easy it's just silly: using thin white fabric or tissue paper, cut out a large skull shape (or two). If you're not a natural artist, find one on the internet to trace. Next, stop by your nearest party store and ask for a black balloon (or two) filled with helium - these usually cost about $1 each. Tie the fabric or paper skull around the balloon with some string and watch it float. 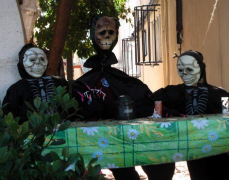 This only works for a day, of course, but for Halloween night, it's a cheap, easy way to greet trick-or-treaters with something eye-catching that moves. Start with a box, a cooler, or a suitcase, Add one hand - this can be something creepy from the 99¢ store, a piece of a skeleton or old doll, or just a glove and a sleeve stuffed with paper. Set the hand up to be reaching out from inside the box. Finally, rummage through your kids' toy chest for some annoying toy that won't stop bouncing, jumping, or vibrating - and put it in the box. Ew - what is that?! Switching out a bulb in a small or dark space for a black light is a great way to create lots of effects. The bulb itself costs about $5-$10, but you can reuse it year after year. Note that the ordinary light bulbs with black tint on the glass that 99¢ stores and drug stores sell at this time of year will not have the same effect as a real ultraviolet bulb. These can be found at places like Aahs, Lightbulbs Unlimited, or other specialty stores. Line a space like a walk-in closet or a laundry room in black, using black fabric, black table cloths, or black garbage bags (you can reuse these later, of course!). Rummage through the toy chest for anything that glows in the dark. Obviously skeletons, snakes, and bugs are great if you have them or want to buy them, but anything that glows looks creepy once the lights are out. Using liquid laundry detergent and a paint brush, make hand prints, foot prints, ghosts, or creepy messages on the black bags/cloths. Switch the bulb to a black light, shut out all other light, and enjoy the spectacle. The detergent will glow; experiment with what else might. White, for example, looks extra-ghoulish under the black light. To make an even more haunting effect, turn the black light off again. If it was on long enough to charge the glow-in-the-dark props, they will glow brightly, and everything else will be truly invisible. After a few hours of making ghosts and demons, there's nothing better than spending some time at a pumpkin patch or Halloween festival - or even better, check out someone else' decorations. All that and more is listed in our Halloween Fun Guide. Happy Halloween!